Marble is to geology what Cher is to the entertainment industry: hard and soft at the same time with an endless capacity for reinvention and an unquestionable ability to dazzle. The only difference is that marble has been beloved for a few (thousand) years longer — even if both the stone and the singer look strangely ageless. Ancient Greeks and Romans used marble for their most monumental architecture (the Parthenon, the Pantheon). Renaissance and Baroque sculptors like Michelangelo and Bernini made the rock look impossibly elastic — flipping, twisting and contorting it into gracefully flowing forms. These days, designers aren’t spending months on end hand-hammering flowery details. 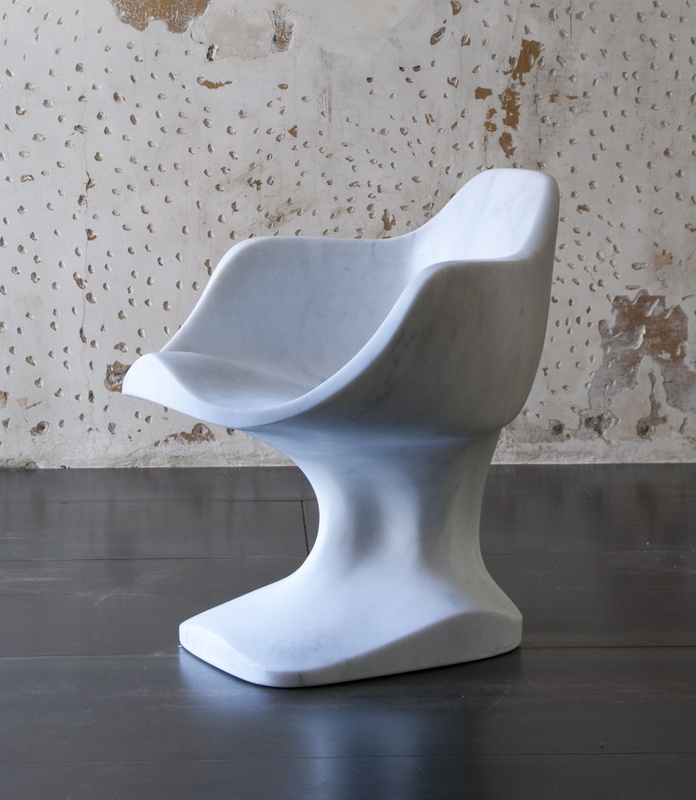 But furniture makers and artisans continue to use marble in fresh, new ways. Part of the enduring appeal is the material’s versatility. It works just as well as a subtle embellishment on a minimalist light fixture as it does as on a wildly curvaceous piece that looks like it was dreamed up for the latest Star Trek movie. It’s also because nothing says luxury quite like the painterly rock. Even in its raw, untouched state, the shimmering, veins and milky surface look opulent and refined. Here, seven bold ways to add the might of marble to your home. 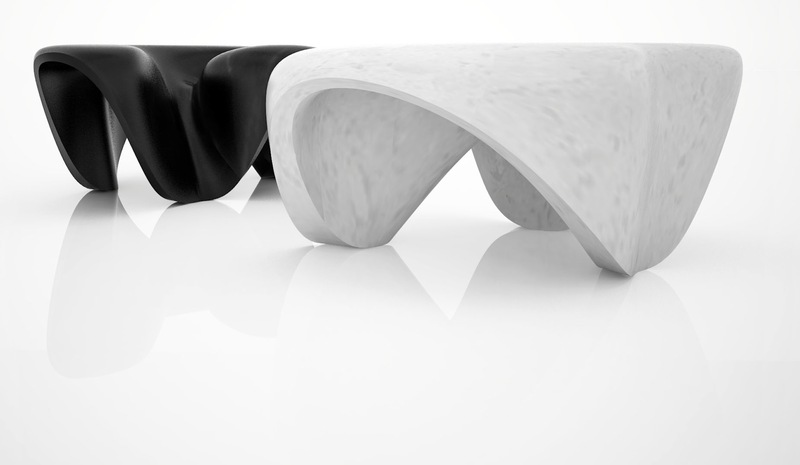 Famed British architect Zaha Hadid has taken marble back to its baroque roots by giving the rock a sweeping, fluid sense of movement. But, this being 2013 and not 1650, the swooping curves of her Mercuric tables were milled with sophisticated machinery, and not painstakingly sculpted by hand. Through citco.it. London’s Studio Vit put a sumptuous spin on the utilitarian bulb and socket. 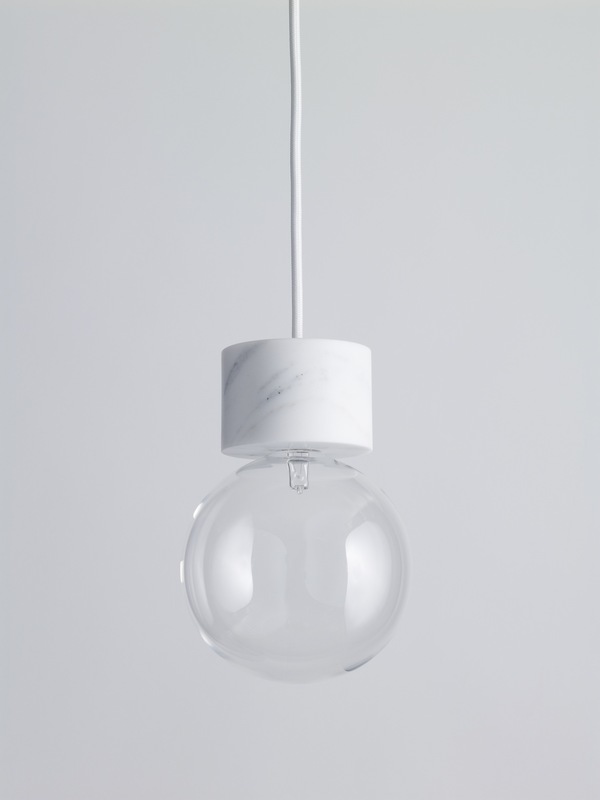 Instead of the usual, chintzy metal fitting, the bulb is cuffed in a creamy marble. When illuminated, the elegant white fixture seemingly floats mid air. Through studiovit.se. The Bust chair mixes the muscular strength of ancient statuary with the mid-centry modern sensibility of Charles and Ray Eames. Libertíny, a Dutch artist, developed the piece with the Henraux Foundation, an Italian studio that, in the past, has worked with legends like Henry Moore, Hans Arp and Isamu Noguchi. Through fondazionehenraux.it. Castor’s BMO Deadstock table is a piece of Toronto history. The Carrara marble top is a slab of reclaimed cladding that was pulled off the city’s tallest office tower, First Canadian Place — cladding that had to be replaced after the rock started falling perilously from the building in 2009. Copper legs add warmth to the cool white stone. Through castordesign.ca. 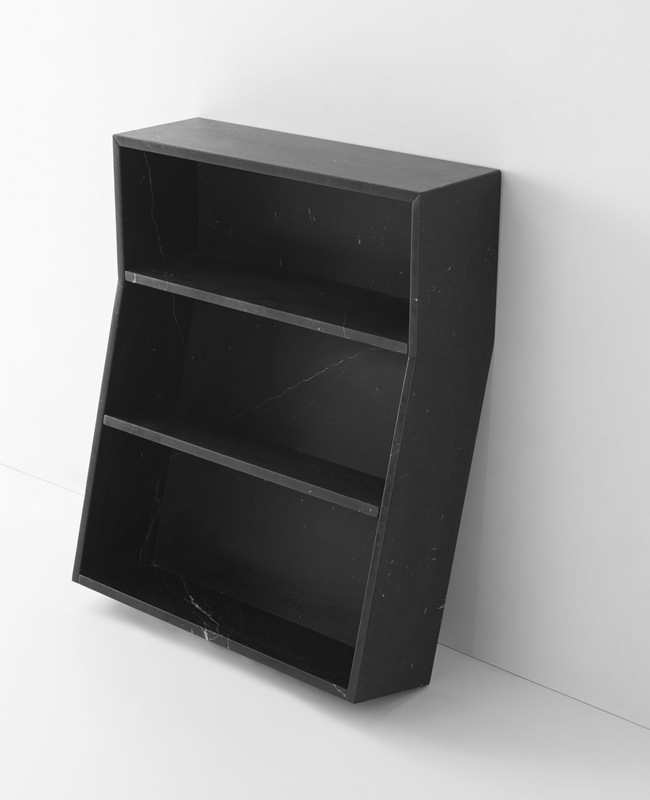 The Melt, by Sweden’s Thomas Sandell, is for people love the simple efficiency of Ikea’s Billy bookcase but want something sturdy enough to last at least two or three life times. The Black Marquina marble, flecked with flight white veins, gives the basic form its stately feel. Through marsotto-edizioni.com. 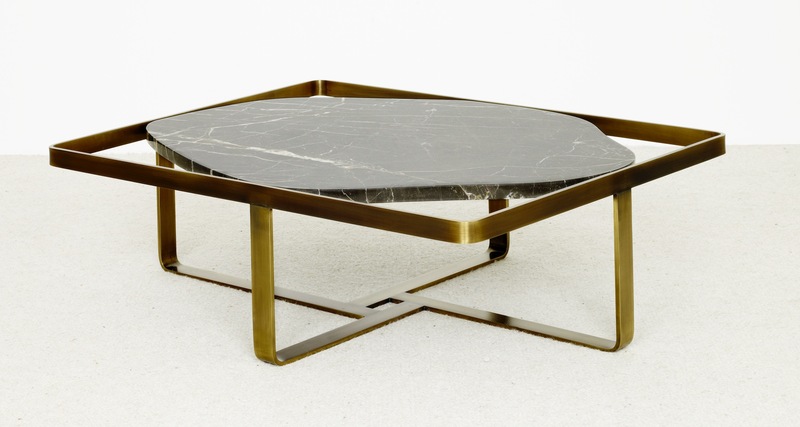 The Jen coffee table, from Parisian furniture maker Christophe Delcourt, with its polished brass and chocolatey St. Laurent marble, is a sumptuous throw-back to ‘70s glam. Through avenue-road.com. 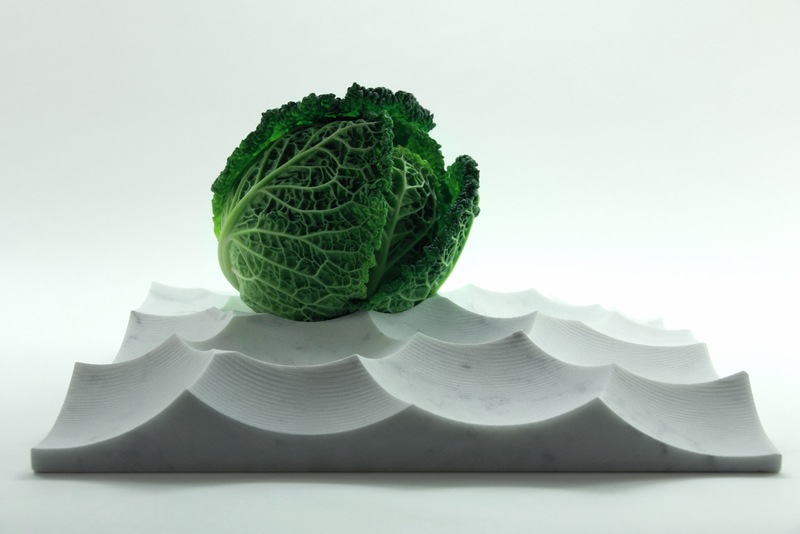 The dips and depressions of Shiro Studio’s Mare Tranqullitatis tray were modeled after the mottled surface of the moon. It was named for a lunar dark spot created by an ancient volcano and is machine milled to look like the fruits and vegetables it holds have crash landed into the Carrara marble surface. Through shiro-studio.com. This piece originally appeared in the Globe and Mail on Thursday, May 30, 2013. This entry was posted in Design Spy and tagged Castor Design, Chair, Cher, Design, Furniture, Globe and Mail, Light Fixture, Marble, Table by mmhague. Bookmark the permalink. Here is an entry about seven beautiful pieces of sculpted marble, but lucky for us marble isn’t just for sculptures anymore! Marble is such a durable stone it can be used for functional spaces such as kitchen or bathroom countertops or as flooring in your home. Visit our website http://www.lufriu.com for information about accentuating your home with stone today!